I’m not a comic fan at the best of times and I do not like what has been done to the Denis Papin steps in Blois to celebrate the annual comic festival called BD Boum. I much preferred the black and white spiral. 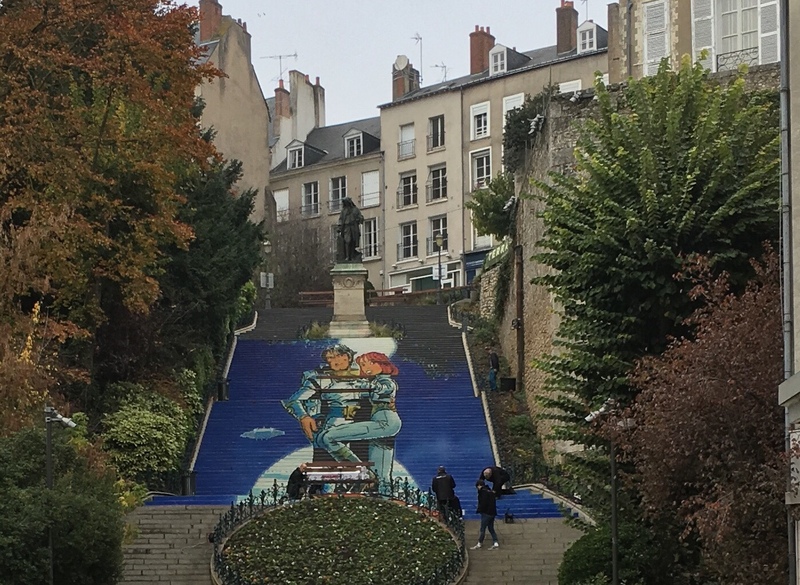 Je ne suis pas un grand fan de bandes dessinées et je n’aime pas du tout ce qu’on a fait de l’escalier Denis Papin à Blois pour illustrer la fête annuelle de la BD. Je préférais infiniment la spirale noire et blanche. The characters look unfamiliar to me, so they haven’t made the proverbial leap across the pond. Very impressive use of the steps, though! I like the spiral too – hope this new picture is very temporary. Helen recently posted…My City – Brisbane – a very relaxed city.